An authentic style that will never feel dated, our Troyer Ridge Mission Bed features plenty of charm to stand as the centerpiece to your entire bedroom suite. At first glance, you're sure to notice the beautifully crafted slats on the head and foot boards that bring to life the simplicity of detail that is so evident in Mission style furniture. Capped off on both ends, a simple trim piece outlines a solid crossboard that elegantly displays all the natural grain in the hardwood. On both sides, square legs provide a rugged base, each one topped with a beveled edge cap that adds subtle details to the piece. The solid wood side rails hold them both together and complete the entire look. Customize this bed by choosing from four standard sizes, each one offering a different dimension to ensure the bed fit to whichever room you choose. Once you've narrowed down the size, choose from an array of different hardwoods and finish options to form the perfect combination to match your decor. You can also select this bed with a low footboard, which will free up space and place emphasis on the head of the bed. 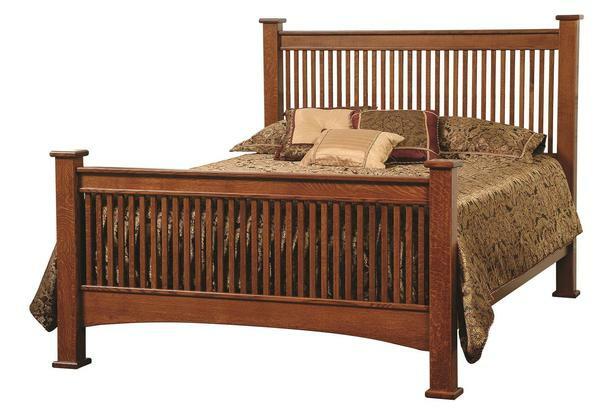 Call one of our Furniture Specialists today with any questions you may have on our Troyer Ridge Mission Bed. We have stain samples available to help make your decision an easy one, and would be happy to help you start your order by phone.